The Monterey/Carmel area offers a cornucopia of experiences to inspire lovers of all kinds — nature, art, literature, history, wine, food and romance, to name a few. It's been the subject of diverse works by authors from John Steinbeck, Robert Louis Stevenson and Robinson Jeffers to modern cozy mystery writer Shirley Rousseau-Murphy. (Her fictional "Molena Point" where feline heroes are on the prowl is transparently Carmel-by-the-Sea.) 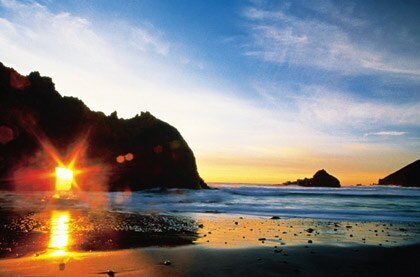 The Peninsula (as locals refer to the region) is about 43 miles south of Santa Cruz on two-lane Highway One. It's an interesting and pretty drive, but often comes with heavy traffic and delays. On the plus side, Moss Landing is home to The Haute Enchilada, which offers a pet-friendly patio, an avant-garde gallery and elevated Mexican cuisine. Travelers on Highway 101 can get to the area via Route 156 to Route 1, stopping in Castroville (known as the Artichoke Capital of the World), or by exiting onto scenic Route 68 that goes past the famous Mazda Laguna Seca Raceway and the Monterey Peninsula Airport. Close to the intersection of Routes 1 and 68, Monterey's Hyatt Regency is a great central location for visiting local attractions. With onsite restaurant, TusCA Ristorante, swimming pools and spa, this full-service resort caters to families and business travelers alike. For a smaller boutique experience, family-friendly Hofsas House in Carmel has rooms with kitchenettes, reasonable prices and fun packages. Not far away, The Cypress Inn (co-owned by Doris Day) combines a retro-cool bar scene with freshly remodeled, comfortable and pet-friendly rooms. No matter where you stay, once you get settled you should head over to Monterey's Cannery Row, vividly described in John Steinbeck's novel of the same name. 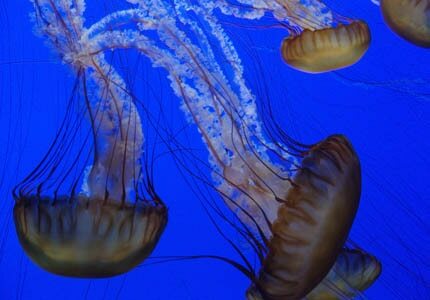 Have lunch outside on the patio at the Clement Intercontinental's "The C" Restaurant and walk to the internationally acclaimed Monterey Bay Aquarium. Grab a spot for the otter and kelp forest feedings at least 15 minutes ahead of time for best viewing, and don't miss the "Tentacles" display for some of the most intriguing sea creatures you've ever laid eyes on. After viewing all that seafood, try not to feel guilty for craving some, and head over to Old Fisherman's Wharf for dinner. Yes, it's touristy — but it's home to good food. Guests win in the (mostly friendly) competition among the families that have owned the Wharf's restaurants for years — and in some cases generations. 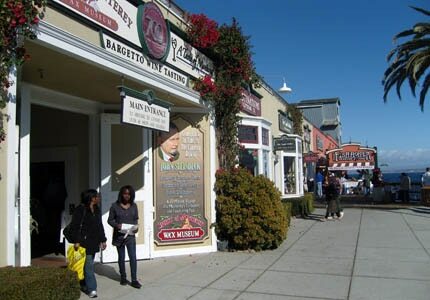 Sample clam chowder, shop for silver and pearl jewelry, and then settle in at Domenico's or Abalonetti for a taste of Old Monterey's best squid and seafood treasures. Amble over to historic Restaurant 1833 (just a few blocks away) for a 1950s or 60s inspired nightcap and fabulous housemade dessert before calling it a night.